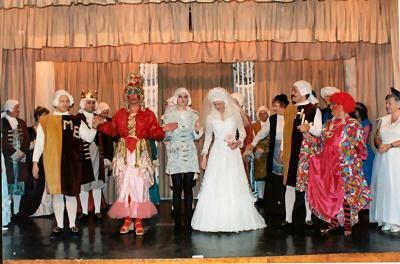 In 1993, a group of greenhorns decided to introduce a Pantomime into the Parish. Rules were set – anyone who wanted a part would get one - the entrance price and content would allow villages to bring their children. Appeals were made for curtains, dresses, wigs, paint, etc. etc. and our version of Cinderella was penned. Many busy bees worked at their allotted tasks and in January 1994 Cinderella was performed - not without panic when the scenery "flats" that had been made to measure in a garage were 12 inches too high to install! A sturdy hand with a saw and panic was over. 1st Eaton Bray Brownies were invited to start the show as student fairies under a Fairy Godmother tutor and a choir sang our own song, the last verse of which is still sung at the end of a Panto today. The show went like a bomb and ST MARY'S PANTO GROUP were underway. In May 1995 we presented a Revue to mark the 50 year anniversary of V.E. Day and at the same time changed our name to THE EDLESBRAY PLAYERS, incorporating EDLESborough and Eaton BRAY. We made our own flag to fly and wrote our own song which sums up the two villages “togetherness” despite the County Boundary dividing us. Today the Brownies have retired and we now have a strong Young Players section performing in the Pantomimes which signals a healthy future. Please look around and get in contact with us. The Edlesbray Players have been putting on pantos since 1993/4. See the Pantomime pages for more information. Starting in 1995 with a V.E. Day revue, this tradition has been continued over a number of years.